Remote support meets the needs of millions of businesses worldwide since it helps companies achieve their business and financial goals faster and more efficiently. Our remote computer access application can boost productivity and improve profitability by cutting down costs in various arenas of your business. The application is completely secure and reliable. As a Premium user you can customize your account in many ways. Automatically email this password to yourself. Add Logo, change title, get Conference Call Number. The remote users getting support will NOT have to give you the 14 digit passwords. Default password length is 4 digits.This password length can be configured from 2 digits to 10 digits. Screen Sharing for Online Presentations, and restrictive firewalls where viewers can simply watch using standard browser. Anyone allowed can view the broadcast without the need of any plug in or download, purely browser based. Broadcast your screen to provide Powerpoint presentations, meetings and demonstrations online. How to conduct a screen sharing session? 1. To share your desktop, click on link 'Show My PC' and click Show My PC. 2. Give shorter password (or auto email) to remote viewers. 4. Enter the shorter password to connect. How to start Free Instant Meeting? 2. Click on "Show My PC" button to generate password and make your computer accessible remotely. 3. Give the password to remote user. They will choose "View PC" option. Premium Version: How to Schedule meetings? 1. Launch ShowMyPC and click "Scheduled Meetings" under Options. To schedule a meeting, enter the desired numeric password and click Invite Users. To start a scheduled meeting, enter you scheduled numeric password and click "Start Scheduled Meeting". Premium Version: How to Attend a Scheduled Meeting? 1. Launch PREMIUM Version: Get meeting password from the host. Click View Remote PC and Enter the scheduled password. Meeting users can do Screen Sharing, Chat, Whiteboard, Web Cam and Phone Conference all in a single meeting room. As a Premium user you start a Web Conferencing with multiple users. Users can join from Windows, Mac, or Linux or any mobile device. Users can use Computer VOIP (International) or call in using regular telephone line (US, Canada, Local/Long Distance). Web Conferencing is available with all Meeting packages. How to start Web Conferencing? 2. 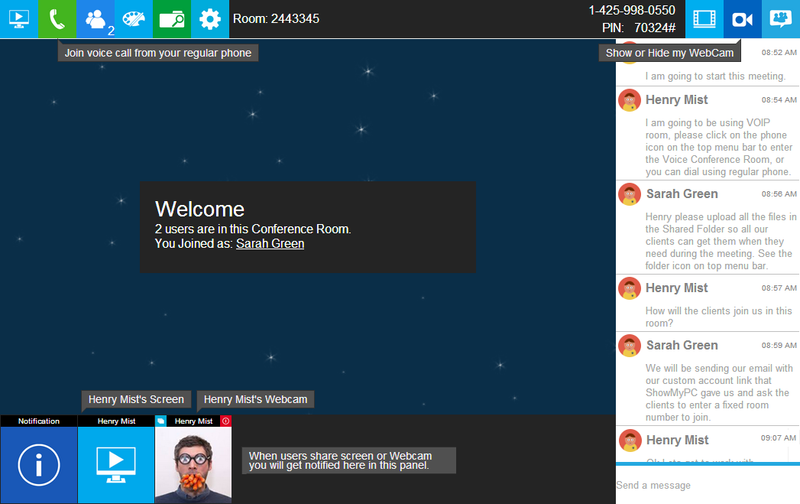 Send the above info along with your ShowMyPC web site link and ask the remote users to Click on 'Web Conference Chat'. 3. Participating users will enter the room name and their name to join. Have Fun. 1. To share your desktop, Click ShowMyMac on the ShowMyPC home page. 2. Wait for the file to download, then run it. Look it up in the Downloads folder. We recommend saving it for future use. 3. Click on "Show My PC" button to generate password and make your computer accessible remotely. 4. Give the password to remote users. 5. It is recommended to use HTML Viewer to connect to this session. Premium clients may follow the same steps on their private website. If prompted for Account Name, enter the domain provided by ShowMyPC for your account. Eg. if your domain is http://mycompany.showmypc.com, enter mycompany as the input. 3. Enter the password and click arrow to view remote screen. ShowMyPC provides a Java based cross platform version which works on a Mac, Linux or Windows. 3. Give the password to remote users. 2. Enter the password and click arrow to view remote screen. Windows users may optionally Launch ShowMyPC3520.exe and choose "View Remote PC". 1. Download the latest jar file. Search 'ShowMyPC' in App Store, download the app and launch. 1) On PC or Mac, Remote user will share screen and give you the password to connect. 2) On your device, click 'Paid User' to login once as Premium user. 3) Enter your ShowMyPC subdomain e.g. 'mydomain274'. 4) Go to the Meeting tab and enter password to connect. 1) On PC, follow instructions in your signup email, to setup service on your remote PC. 3) Enter your ShowMyPC account subdomain e.g. 'mydomain274'. 4) Go to the Unattended PCs tab to see your list of remote computers. 5) Select the PC you wish to connect to, enter password, click on "View Remote Screen" and connect. 2) On your device, enter password and run to connect. 3) Free version may have limitations with session timings and performance during peak loads. 1) All users can send meeting invitations using email contacts from your mobile device. 2) For Premium users, the meeting password will be generated, and invited users will click on the email link to start sharing their screen. 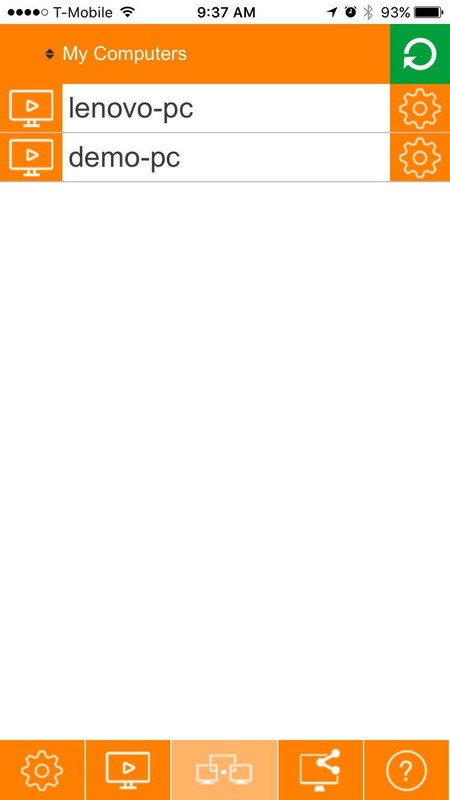 3) You can then navigate to the Meeting tab in your app, and start viewing remote screen right away. The app is compatible with Android, iPhone, iPod Touch, and iPad. Android 3.0 or iOS 10.0 or later.